As part of Living in Thailand, the Rice Field Project follows our journey of buying land and preparing it for building our house. This is part 3a. 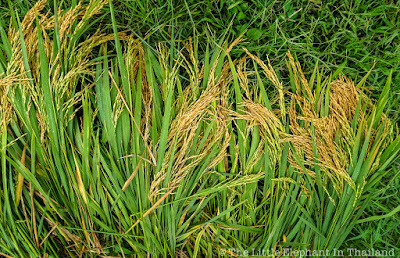 To read the other parts click on the tag Rice Field. We bought the first plot of land in September 2017. The extra plot of land was bought in November 2017. 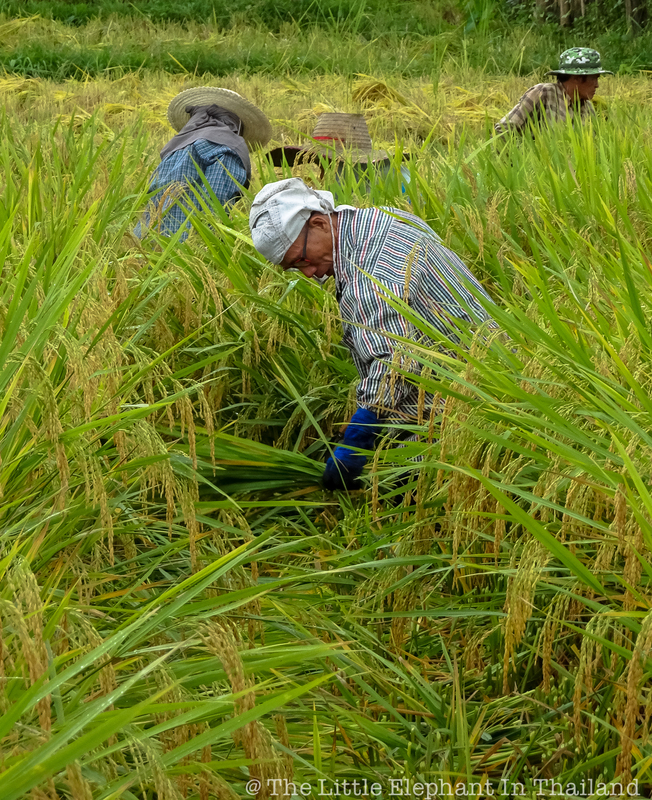 Update at 11 October 2018 : As we bought our rice field land with rice the first step of clearing the land is cutting & harvesting the rice. 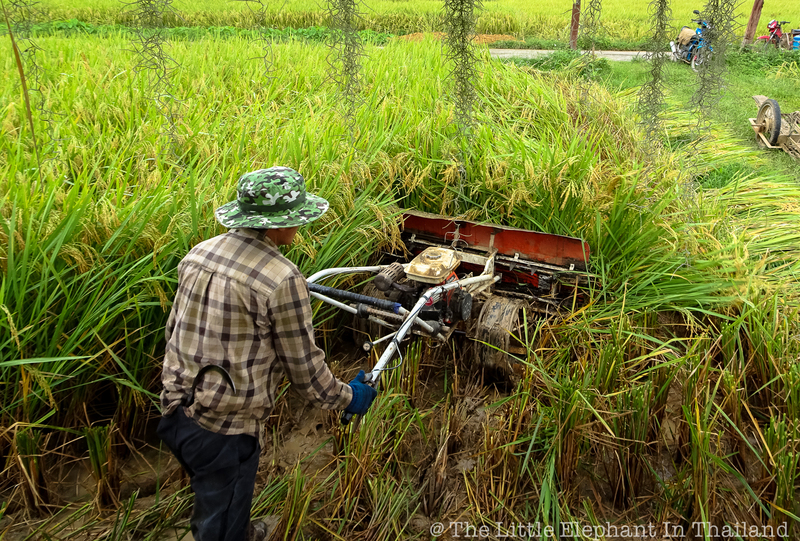 The cutting (reaping) starts by hand, cutting the rice around the land so the small rice-cutting machine can drive over the field. 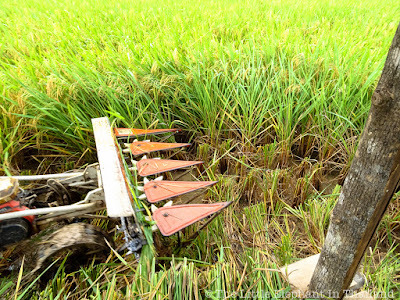 Traditionally the work is done on the rice-field fully dressed as protection against sun. And wearing rubber boots as the ground is still one big mud pool. You (well my wife and another farmer) take a bundle of rice in one hand and cut it with a curved knife. Then you lay the bundle of cut rice on the land. After the preparations (1 hour) the little rice cutting machine comes in. It is managed by 1 person walking behind it. 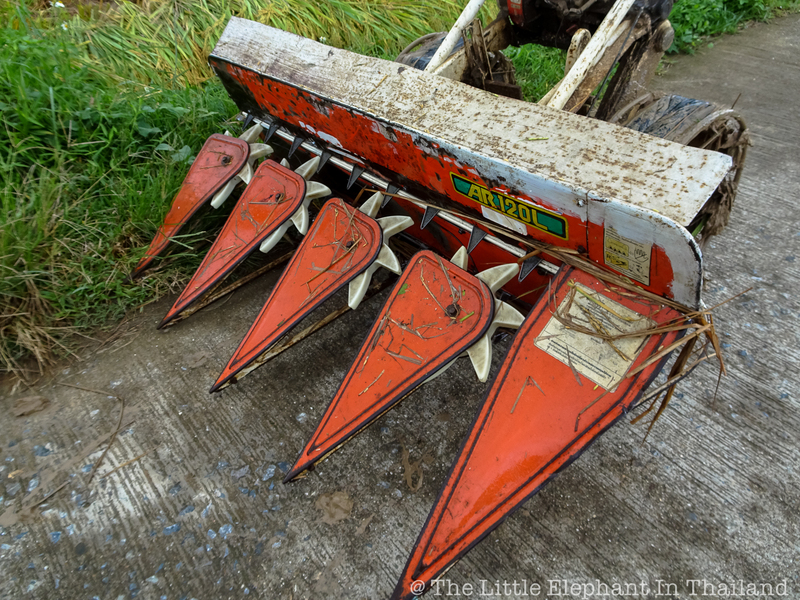 Under are moving knives to cut the rice and on top are rotating small "arms" that will move to rice to one side. Very easy and cheap. 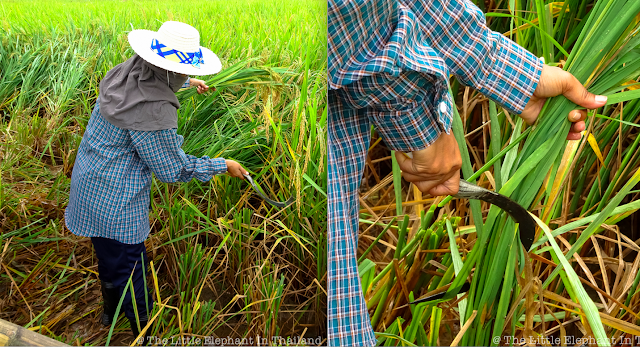 We pay only 200 THB for our small piece of land and it takes only about 1 hour. 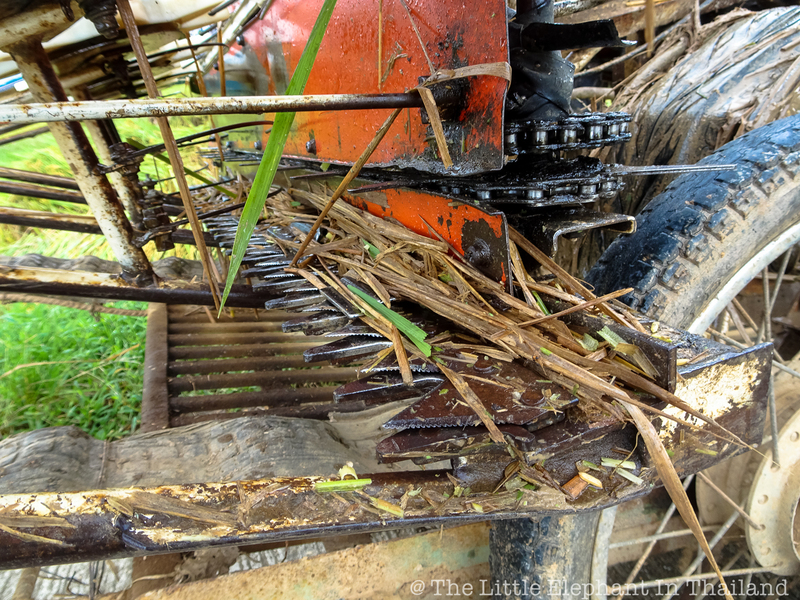 After the cutting of the rice it will have to dry for a few days (hopefully not too much rain anymore). 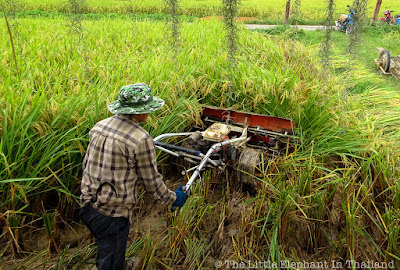 After that a machine will come to split the rice from the straw, called Threshing. Then the rice will be put in bags of about 45kg. This is then brought to a rice-mill to clean the rice and make it ready for consumption. A lot of work for a little bit money as rice is cheap. 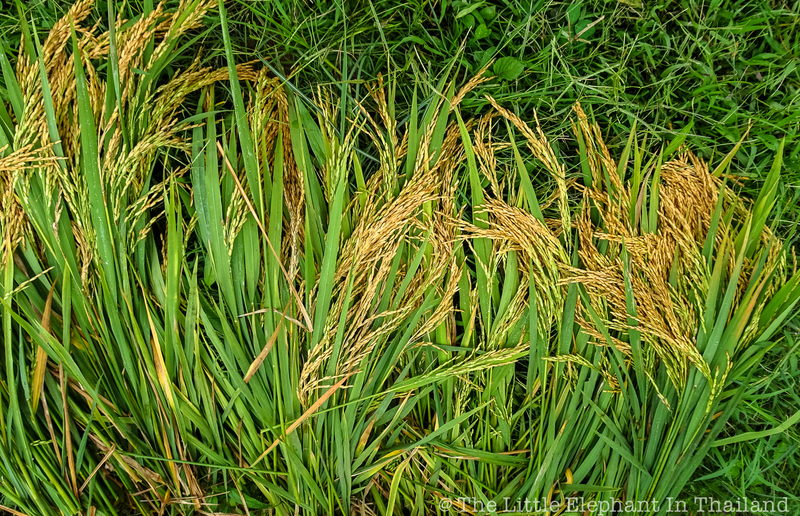 Update : The rice have been removed from the land and is now awaiting the Threshing & Cleaning.